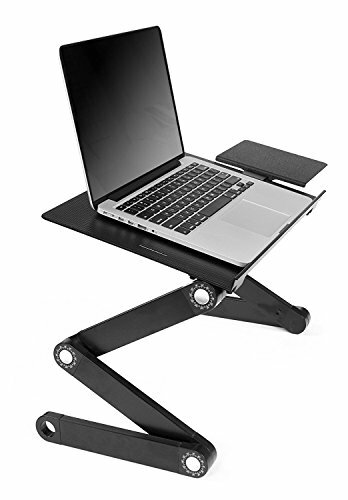 JH-Best Crafts Laptop stand is designed with your convenience in mind when using your computer laptop, to stop or eliminate the muscle strains in your neck and back by creating an adjustable and foldable computer desk that is so versatile you can use it while standing, sitting or laying down on your bed. it is made of light and yet strong aluminium that weights less than 5 pounds and can support up to 30 pounds capacity. You can set up your office just about anywhere. Our adjustable computer desk is so versatile it can also be used as a TV Dinner Tray, Breakfast Tray, Sound Equipment Table, Projector Table, bed tray, tablet tray holder, writing desk, standing desk / stand up desk. compatibility: Our laptop table is compatible with; acer aspire one, m5 r7 s3 s7 v5; Travel Mate/ apple MacBook 13" 15" 17" (pro, air, Unibody) PowerBook g4 / ASUS VivoBook, Zenbook prime, Eee pad transformer book trio, infinity, Taichi, ROG / dell Inspiron, latitude, XPS 12 14, precision, Alienware, Vostro/ FUJITSU Lifebook / HP pavilion, envy, Spectre, split x2; EliteBook folio, ProBook, ZBook; Compaq Presario / LENOVO IdeaPad, yoga; ThinkPad, x1 carbon, twist / PANASONIC Toughbook / SAMSUNG ATIV book 2, 4, 5, 6, 7, 8, 9, lite, plus, Chronos, smart pc, Chromebook 2 / SONY VAIO, tap 11, duo, flip / TOSHIBA satellite, Qosmio, KIRAbook, Portege / MSI, gateway series. VERSATILE: Ideal for laptops up to 17 inches with mouse holder and the full extension height is about 19 inches. The computer laptop table can also be used for TV Dinner Tray, Sound Equipment, Projector, Standing Desk, Book Tray, Writing Desk, and Tablet Holder, Bed Tray, Breakfast in bed tray and much more. LIGHT WEIGHT: Made of high strenght light weight aluminum with strong and sturdy adjustable legs that rotates 360 degress that lock in place at various angles, for standing, sitting on your couch or laying down on your bed. These legs are collapsable for portability to carry around. NO ASSEMBLY REQUIRED. CONVENIENT TO USE: Without straining your neck and back, lay back and relax on your couch, bed or stand up to use your computer laptop on our Best Crafts computer table. Buy with confidence. 100% MONEY BACK GUARANTEE: If for whatever reason you need to return this, we will refund back your money with no question ask. Go to the link above and add to cart. Buy with confidence. If you have any questions about this product by JH-Best Crafts, contact us by completing and submitting the form below. If you are looking for a specif part number, please include it with your message.